Suffering • Angelic painting reminds Mormon mom she is not alone. Lennie Mahler | The Salt Lake Tribune Brian Kershisnik helps hang one of his paintings up on the first floor of the LDS Conference Center with painting owner Cris Baird, left, on Thursday, April 3, 2014. 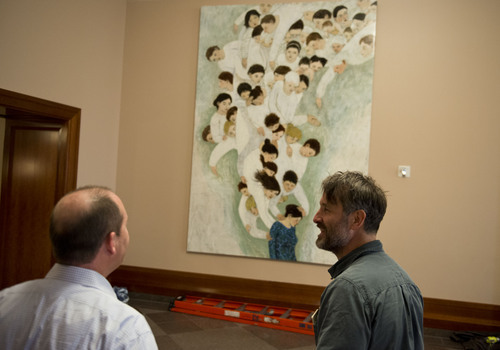 Lennie Mahler | The Salt Lake Tribune Artist Brian Kershisnik and Cris Baird observe the painting hung on the first floor of the LDS Conference Center on Thursday, April 3, 2014. Lennie Mahler | The Salt Lake Tribune Artist Brian Kershisnik's painting on the first floor of the LDS Conference Center on Thursday, April 3, 2014. 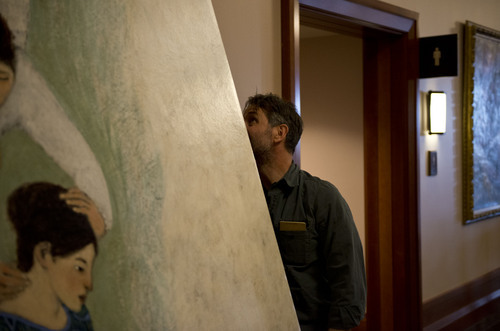 Lennie Mahler | The Salt Lake Tribune Artist Brian Kershisnik hangs one of his paintings up on the first floor of the LDS Conference Center on Thursday, April 3, 2014. Lennie Mahler | The Salt Lake Tribune Cris Baird photographs his painting hanging on the first floor of the LDS Conference Center on Thursday, April 3, 2014. Baird flew in from Texas overnight to see the painting hung. Lennie Mahler | The Salt Lake Tribune Artist Brian Kershisnik straightens a painting on the first floor of the LDS Conference Center on Thursday, April 3, 2014. After her last child&apos;s birth, Baird underwent pelvic reconstruction and, as part of the preparations, had a blood test. Turns out she had hepatitis C, a viral disease that can cause liver failure and other serious health problems, many of which she had already suffered. During 11 long months of 2006 and 2007, Baird took pills and gave herself shots to eliminate the virus. She was often exhausted and occasionally suicidal. On a particularly low day about midway through the treatment, Baird was lying in her bed and yearned to let go, to be done with suffering. LDS friends had stopped bringing casseroles. No one called to see how she was. She felt forgotten, alone. "Fear not: for they that be with us are more than they that be with them" (2 Kings 6:16). "I had this image in my mind of thousands of angels looking down on me who hadn&apos;t forgotten me," she recalls in a phone interview. "They were wishing for me to go on. It was not time for me to go home. They knew me and how hard it was. They felt my pain." That angelic vision has stuck with Baird through these past years, so when she was in Salt Lake City two weeks ago, shopping at Salt Lake City&apos;s Deseret Book store, and came upon a smaller version of Brian Kershisnik&apos;s 2012 painting "She Will Find That Which Is Lost," she burst into tears. The piece features a woman, clad in turquoise, with head bowed, while a throngs of angels touch her head, her shoulders, her arm in comforting gestures. Others stretch their white-robed arms to offer support. "This is what I saw," Baird says. "I saw all those people on the other side encouraging me." 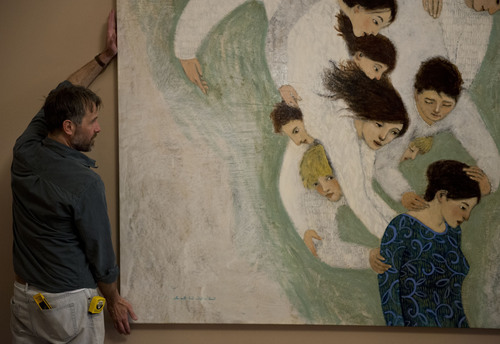 When the Bairds discovered that the 8-by-11-foot original was still available, they bought it from a Park City gallery. But they agreed to allow the painting to be on display in Utah for the next 13 months so it can be viewed by crowds of Latter-day Saints. The painting was hung Thursday in the LDS Conference Center  just in time for this weekend&apos;s semiannual General Conference, which draws 100,000 Mormons over two days to downtown Salt Lake City. "It represents such a strong moment in my life, such a pivotal moment in my treatment," Baird says. "We have so many friends who see in it different things, who have been touched in different ways." Some people see in the artwork a hint of divinity, or a sense of revelation, says Cris Baird, who flew in for Thursday&apos;s installation. "Others see family ties or family history. They see extrahuman strength during times of trial." Members of The Church of Jesus Christ of Latter-day Saints believe angels are connected to us, he says. "There&apos;s a strong theological element in the piece, but people come with their own experiences." 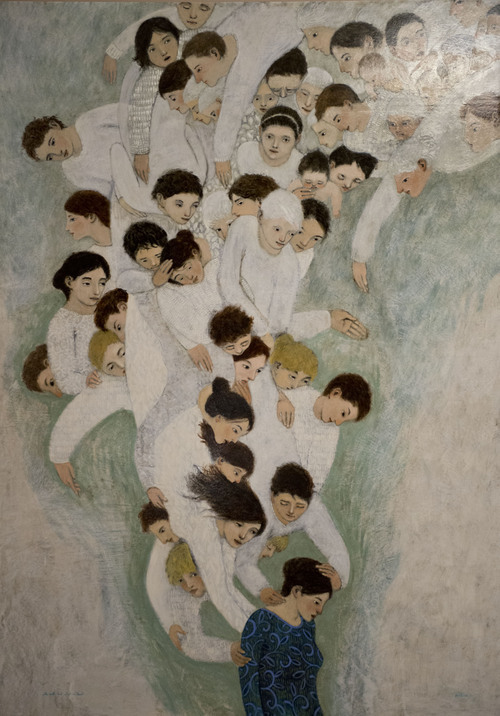 Like any artist, Kershisnik painted from his own experience  of a suffering loved one who needed help from beyond  but hopes people find themselves in it. "All of us have dealt with loss and injustice and have been saved and rescued from them in ways we didn&apos;t even realize," he says. "My sense of the universe is that the dead  or the unborn  have an interest in what&apos;s happening here. I don&apos;t feel abandoned. I feel the angels  my people  are on it." His "people"  multigendered and multigenerational  don&apos;t tell him what to do, the artist says, but they do provide a kind of succor. Kershisnik is pleased that his painting will hang in the Conference Center for the next three General Conferences, which meet every six months, and that tens of thousands of believers may stream by it  or connect with it on some universal level. The woman in the center of the canvas is looking down. A lot of energy is being focused on her but she&apos;s not feeling it, the artist says. Whatever troubles her is not over, "but she is not abandoned." And Janae Baird knows the same goes for her. than they that be with them."